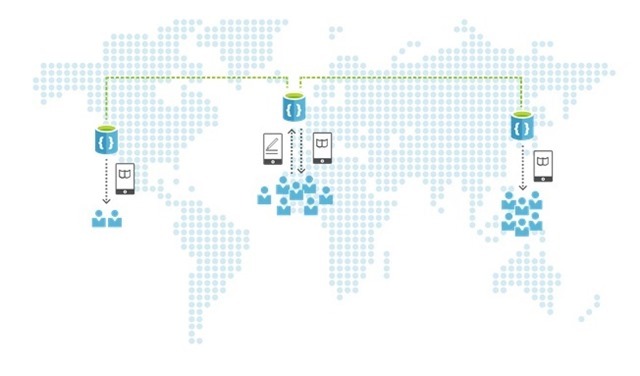 Global distribution of Azure DocumentDB databases now is generally available. Learn more in the documentation article, Distribute data globally with DocumentDB. Developing cloud applications presents a unique opportunity for businesses to reach new markets and customers that span the globe. The reach of an application is no longer constrained by a business’ ability to build IT infrastructure but rather how quickly it can develop applications that scale globally. Not only must these applications be accessible from anywhere, but in order to win customer loyalty they must be responsive and highly available. For developers, global reach presents new challenges. The burden is placed squarely on them to make the right tradeoffs when developing geographically distributed applications. The current set of fully managed, multi-tenant, distributed databases fail to provide clear options and trade off performance, availability and consistency for globally distributed data. In most cases, developers are faced with the stark choice of strong or eventual consistency. They are forced to choose between an intuitive programming model or lower latency and higher availability. Today we are pleased to introduce global databases for Azure DocumentDB. Global databases allow you to replicate data across multiple Azure regions to achieve low latency access with well-defined data consistency while offering clear availability SLAs. Global databases are designed to meet the needs of planet scale applications such as IoT systems serving globally distributed devices or internet scale web applications that deliver highly personalized experiences. In addition to global databases, at the //Build conference this week we also announced several service updates to make it simpler for developers to build scalable applications with DocumentDB. New pricing and collection scaling options allow for larger data volumes and throughput levels for database collections. We have also extended DocumentDB so that applications can seamlessly communicate through existing NoSQL APIs and tool chains. With the introduction of native support for the MongoDB wire protocol, you can now easily and transparently access the data managed by DocumentDB using existing MongoDB drivers. DocumentDB global databases allow you to replicate data across multiple regions to deliver highly available applications with global reach. These multi-region databases offer well defined consistency guarantees and seamless failover capabilities for continuous operation of cloud applications. Since the launch of DocumentDB, we provided the ability to choose weaker forms of consistency with predictable programming models while maintaining the benefits of low latency and availability. Session consistency offers read-your-writes guarantees and can be an ideal choice for many user centric applications such as social, gaming and retail. Bounded staleness provides a good choice for applications that require global total order such as collaboration or communication. With global databases, the benefits of weakened consistency become more relevant as data is geographically distributed for application use. Global databases dramatically simplify how you deliver highly available applications at planet scale. In addition to offering multiple consistency levels to choose from, global databases also offer policy driven transparent failover mechanisms to remain available in the event of disaster. DocumentDB global databases are now available in preview, visit the sign-up page for more information. New pricing options now allow you to purchase reserved throughput and database storage independently. With this, indexed storage will be billed based on gigabytes stored per hour and throughput will be billed based on the level reserved on an hourly basis. Throughput can now be set in granular increments to match the exact needs of your application. For existing customers, you can choose to stay on the current pricing plan or switch to the new model and realize higher collection throughput today. We are also excited to introduce the ability to store larger data volumes and process more requests with a single DocumentDB collection. New partitioned collections provide a great option for applications that ingest large volume of data at high rates or applications that require high throughput, low latency access to data. With partitioned collections, you can now process 10 of billions of requests each day with a single DocumentDB collection. Applications can now easily and transparently communicate with DocumentDB using existing, community supported Apache MongoDB APIs and drivers. As a developer, this means you can use existing MongoDB tool chains and skills to build applications that leverage DocumentDB. You will benefit from DocumentDB’s unique capabilities including auto-indexing, transactions and globally distributed databases. DocumentDB uses this new support for the MongoDB wire protocol to enable Parse applications to run on Azure. Parse customers now have a fully-managed, end-to-end cloud solution backed by Azure services. The DocumentDB protocol support for MongoDB is now in preview. We hope you take advantage of these new features and capabilities. Please continue to provide feedback on what you want to see next. Try out DocumentDB today by signing up for a free trial and create a DocumentDB account.